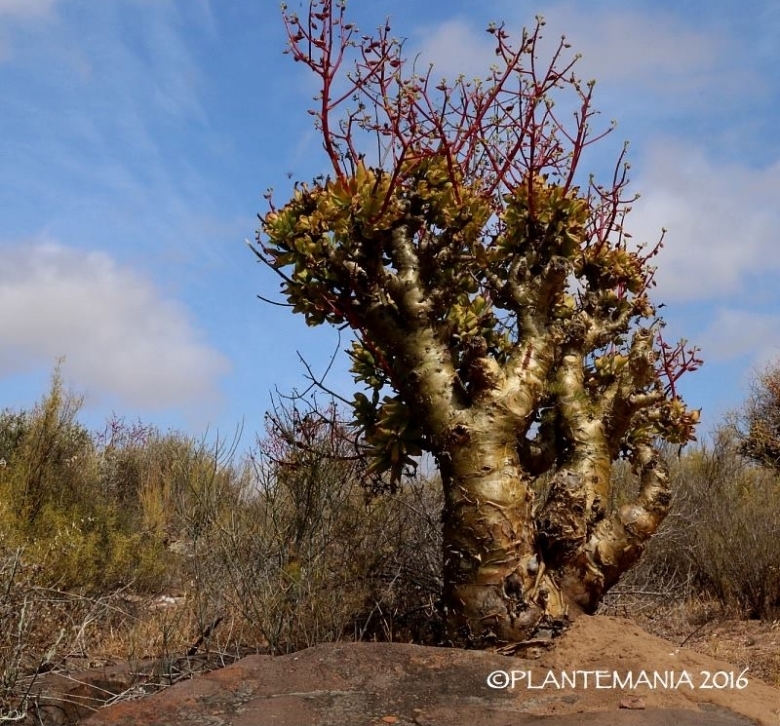 This pachycaul succulent also known as the butter tree, is famous for its fat, gnarled trunk that can be cut with a dinner knife. Origin and Habitat: Widely distributed from the Auas Mountains in central South West Africa/Namibia but mainly from south-western areas of this country and locally common in Namaqualand and along the western Cape coast, through the Little Karoo and often in the mountains in the Great Karoo. Habitat and ecology: Tylecodon paniculatus appears to have wide tolerance of growing habitats, growsing on rocky slopes in sheltered ravines or valleys but also in on sandy loam with quartz along the coast. The plant grows to nearly 1.5 m tall, in the parts of arid southwest Africa that have winter rainfall. In nature the plants tend to grow in groups, making a spectacular show when they flower. Common species in this area includes Elytropappus minocerotis, Didelta spinosa, Senecio cinerascens, Othonna arbuscula, and Stoeberia beetzii var arborea. The attractive flowers are borne on bright red stalks, which add to the attraction this plant has for pollinating sunbirds. The flowers contain nectar protected by a tuft of hairs halfway up the inside of the corolla tube. These hairs are easily pushed aside by the bird's beak, and lesser double-collared sunbirds have been observed visiting the flowers. Flowering period: November, December (January). Tylecodon paniculatus, hybridises with Tylecodon wallichii. 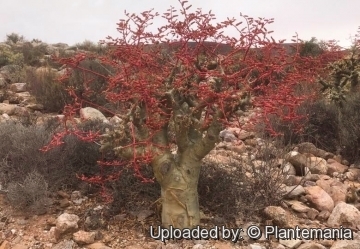 Description: Tylecodon paniculatus, locally known as the botterboom ('Butter Tree'), is a perennial succulent shrublet or mall tree with stout, peeling baobab-like stems up to 1.5 metres, occasionally to 3 metres tall, making them the largest of the tylecodons. The bright green, paddle- shaped leaves, absent at flowering are borne in clusters towards the tips of the thick, fleshy stems, and branched stems of nodding, urn-shaped flowers, 15-20 mm long. Flower colour varies from greenish orange through bright orange to dark red or purplish red. Stem; Thick, caudiciform, much branched up to 1,5 m tall, 0,6 m in diameter. With time, the main trunk becomes very thick and is characteristically greenish yellow to olive-green in colour and covered with a thin peeling, yellow papery bark. Branches short, with conspicuous scars left by the fallen leaves. The plants conserve energy by photosynthesizing through their stems during the hot dry summer months. Roots: This plant is reported to have a surprisingly weak and shallow root system for its size. Leaves: Spirally arranged, in clusters towards the tips of the stems, thick and fleshy, glandular-pubescent to glabrous, bright green to yellowish green, obovate, 60-120(-250) x 30-100(-120) mm, dorsiventrally flattened and with an indistinct groove along the midrib. Apex broadly tapering to rounded. Base tapering (cuneate). Margin entire. Petiole absent. Tylecodon paniculatus is summer deciduous. Flowers: Pedicels 6-15 mm long, red. Calyx 4-6 mm long, glabrous or rarely with few scattered hairs, varying from greenish orange through bright orange to dark red or purplish red. Sepals 5, joined, lobes triangular, acute. Corolla glandular-puberu-ous to glabrous outside. Petals 5, joined, forming a yellowish red tube cylindrical to slightly broadened at mouth, 12-16 mm long, with few fine hairs inside where filaments are fused to tube, yellowish orange to red. Lobes (8-) 10-13 mm long, recurved or recoiled, yellowish-orange with yellow and dark red spots in throat. Stamens 10. Anthers c.2,5 mm long. Squamae transversely oblong, 0,8-1 x 1,8-2,1 mm, slightly emarginate, fleshy, yellow to orange. Fruit: An upright capsule, made up of 5 separate carpels, and surrounded by the papery, persistent petal-tube. Seeds: Very fine and light brown in colour. The seeds are released during the autumn just in time for the winter rains. 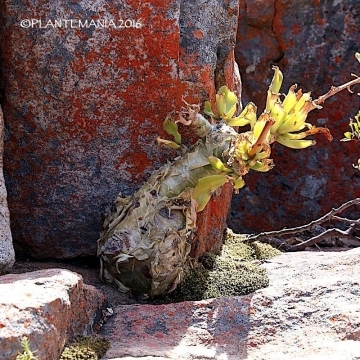 8) Court, D. “Succulent flora of southern Africa”, revised edn. Balkema, Rotterdam. 2000. 9) Barkhuizen, B. P. “Vetplante van Suidelike Afrika.” Perskor, Johannesburg 1978. 10) Henderson M. “The Flowering Plants of Africa” 29: t. 1142.1953. 11) Burges, S. “Poisonous plants 2: Botterboom.” Farmers Weekly,1 March: 28. 2002. 12) Gess, S. et al. “Birds, wasps and tylecodons: pollination strategies of two members of the genus Tylecodon in Namaqualand.” Veld & Flora 84: 56, 57. 1998. Cultivation and Propagation: Although usually grown only by specialist caudiform grower it presents no great difficulty in cultivation. It is a winter grower, dormant in the summer. Growing rate: This is a very slow growing species. Soil: Tylecodon paniculatus, like all other caudiciforms, requires very well-drained soils. Out-of-Doors prefers sandy soil, sandy loam soil provided the drainage is good. In pot it needs an open medium comprising equal parts of well decomposed compost or finely milled bark, and river or silica sand (or pumice) or a well drained, cactus compost. 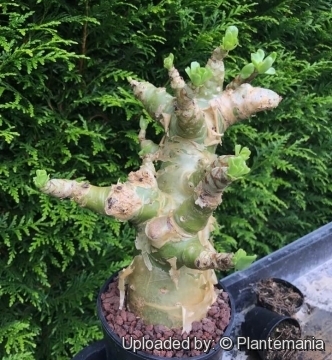 Repotting: Re pot every 2/3 years using the above compost with added slow release fertilizer, but fully grown plants can remain in the same position for many years. Plant it with the neck at soil level and grow it in pots with a diameter of at least 25 cm. Give it excellent drainage. Fertilization: Because they are adapted to poor soil, feeding is not really necessary, but some ash will not do them any harm. On pots fertilize moderately during the growing season with diluted high potassium fertilizer. Exposure: It is most suitably grown in full exposed areas but it will even grow and bloom in half-sun. Watering: As it is a deciduous winter-growing plant, it likes moisture from late summer to early spring, and withhold water from late spring to summer (dormancy period). In the growing season water when the roots are almost dry, and reduce watering in winter to once every two weeks. Hardiness: Winter minimum temperature is 5ºC but better at 8ºC. The leaves easily drop off in cool conditions. Garden uses: The plants are mostly grown by specialist caudiciform collectors, usually as container subjects. They are striking feature plants, ideal subjects for sunny, dry courtyards and water wise gardens. Traditional uses: For centuries children have used the soft, slippery stems as sleds to slide down rocks and hillsides. The leaves are browsed on by stock and game, although they are are poisonous. Warning: The plant is poisonous to stock, causing stomach cramps. Pest and diseases: It is susceptible to attack by mealy bugs. Propagation: From seed. Seeds form readily and should be harvested and sown as soon as they can be easily removed from the capsules. The seeds germinate without difficulty. Seeds may take up to two months before the first leaf appears above ground, and a further 10 to 20 years to reach maturity. If it is the intention to plant these seedlings out into a bag or pot, they can be transplanted in their second or third year. Once planted in a permanent position do not dug-up and moved them constantly from one location to the next. A word of caution - do not plant the swollen stems too deep. Ensure the slender neck of the plant is just protruding above the soil with only the root underground. It can also be propagated from cuttings in late Autumn.